I have mixed feelings about the current state of underground techno. Sure, there are a lot of innovative producers out there. But many tracks tend to refer to the creativity of others—to classic records. That’s fine, because that’s how culture functions. But if everybody simply repeats a formula time and time again, it eventually stagnates and turns stale. Juan Atkins’ mid-to-late ‘80s vision of techno is one of those often-referenced blueprints, as is dub techno, a genre developed by Moritz von Oswald and Hard Wax’s Mark Ernestus in the early ‘90s. Without these blueprints, techno most likely wouldn’t be what it is today. Transport mostly relies on sounds that are well-worn, but Atkins and von Oswald are the originators of these tried and tested formulas. While a lot of contemporary underground techno refers to saturated big-room bangers with “harsh noise” or “acid” elements, von Oswald and Atkins unsurprisingly have a different approach, one which is less concerned with dance floor functionality. The album’s predecessors date back over 20 years. Their 2013 collaborative LP as Borderland, which was released on Berlin’s Tresor Records, was more in line with Atkins’ jazzier productions and the records von Oswald made with the Moritz von Oswald Trio. Transport, on the other hand, reminds me more of Maurizio, the seminal mid-‘90s dub techno alias of von Oswald and Ernestus. The overall vibe is repetitive, playful and deep; composition is minimalistic. And while you hear a few compromises between the two artists, on the whole their styles syncopate perfectly. The title track, “Transport”, opens the record. It slowly builds a dubby atmosphere by using repetitive synths, a kick and a sub bass. It has a sketchy minimalistic feel but feels deeper than anything von Oswald and Atkins have done before. It’s one of my favorite tunes at the moment. “Odyssey” gets into slower snare-driven and broken-beat territory. “Lightyears” is a repetitive techno track. The stomping kick drum seems to lead the ensemble, but the track is driven by its deep and powerful organ sound. On “2600”, a subtle and relaxed techno track, you can hear a modulated acidic bass sound accompanied by dub chords. “Zeolites” closes the album and has a house-y vibe that comes with waves of deep-sounding synth sequences. Not everyone responded favorably to the deep, repetitive and sometimes dreamy feel of Transport and its predecessors. Some even seemed surprised by it. But von Oswald and Atkins have long explored more introspective territory in their productions. Their 1992 collaboration Tresor 9 stood in stark contrast to the happy rave music from the era. And critics should be cautious about the different meanings of “dreamy,” too. One refers to repetitive music with a meditative feel; another refers to cheesy chill-out music or big-room trance sounds. Let’s not waste our time on the latter. Making techno with a dreamy feel is a balancing act that takes real skill. Moreover, there’s nothing cheesy about expressing your thoughts, even in the techno world. If everybody seems to be screaming out the same bloodless emotion, it becomes even more important to express deliberate ideas. Atkins and von Oswald could give workshops on how to write good albums within the realm of techno. The tracks on Transport have a deceptively simple feel, but the chords are rather complex. The synthwork is particularly strong; you won’t hear simple melodies that go A-B-C. They build over time like you would expect from a good album. It’s just uncommon for techno albums to have a narrative arc. I think that irritated me in the first place. Don’t expect a techno revolution here. If your head is constantly turning to receive unexpected forms of excitement, Transport is probably not for you. Techno is—of course—pure dance floor music, but longevity comes from approaches that privilege nuance and quality of craftsmanship over the latest trends. If you are a relaxed person and share the vision of a timeless approach to dance music, it will be hard not to enjoy von Oswald and Atkins’ latest Borderland album. 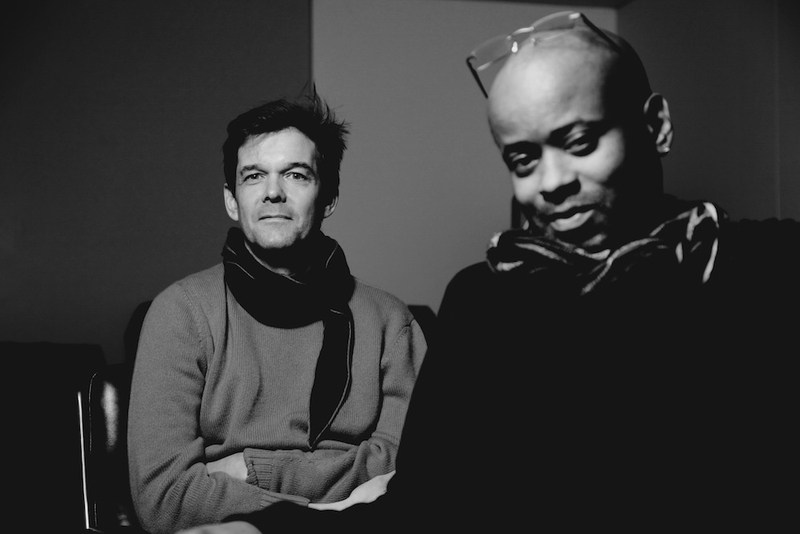 Cover photo of Juan Atkins and Moritz von Oswald by Marie Staggat, creator of 313ONELOVE.